So we are currently on 2/4 Royal Marsden stays within stage 3. Amelia's chemo at this point is a luminous green that pretty much makes your pee a radioactive green/yellow color - much to Amelia's enjoyment. This is the same process as I explained in the previous post, so she will have 4 rounds of these taking us to the end of November, half way through. Amelia's bravery and confidence around procedures is growing, we didn't have the battle we did previously with the cannula, having to hold down your 7 year old daughter to insert a needle into her wrist is not pleasant. Needs must. We have all been in good spirits, enjoying fireworks (Amelia sat indoors) and trick or treating. 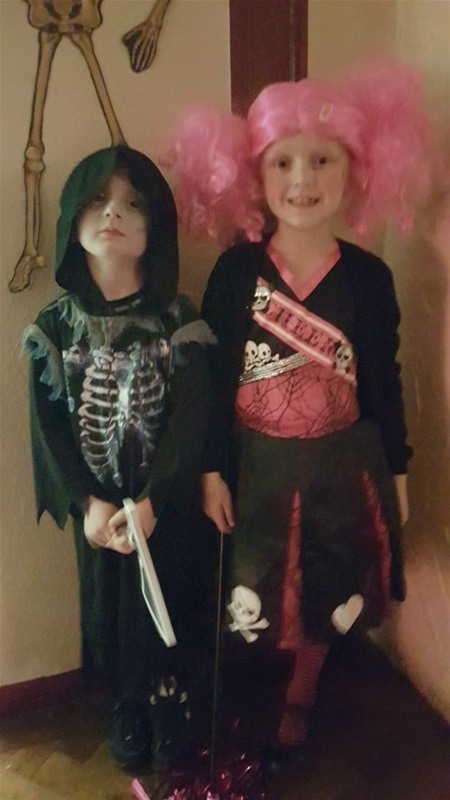 We had a fun Halloween, we managed to do the trick or treating on Monday evening before Tracyann and Amelia went to the RM as Amelia was required a day earlier than planned for another kidney test (GFR). We have been so well supported by our family and friends over the half term period - fireworks, halloween and even Mummy and Daddy got taking out for dinner by Tracyann's brother and wife - cocktails! I find milestones in this journey really helpful - I started off with the end of the Euros, we are now just past halloween, bonfire night next, time flies!